Has anyone gotten their hands on the myenergi harvi? Its a self powered energy monitor with multiple ct support. Really tempted to sniff and try to hack the protocol. Has anyone done this yet? I’ve never heard a mention of it here, so you could be the first. But there seem to be some questionable claims about it. power sensor? Really? VA (apparent power - possibly, real power - unlikely. Accurate measurement? - maybe, provided you can guess the power factor. It would still be interesting to find out exactly what it does. My doubts could be unfounded, but we’ll see. Well its normally paired with the zappi or eddi which have mains connections so they can probably measure additional datapoints there. Ouch! Either way, they’re mighty proud. I installed an Eddi a few weeks ago, with a physically attached current clamp. No wireless harvi. I also have a emontx pushing data into the mysolar app. The emontx uses the AC-AC power adaptor. The attached mysolar extract shows the eddi tracking the solar generation and running the immersion heater. Up until 09:10 it does a really good job, then when the washing machine came on it seems to get it wrong and ends up importing a small amount of energy. The two blocks at 2.5kW are probably the washing machine heating water and the block at 3.5kW is a kettle. At 10:25 the hot water tank is full and the diversion stops. 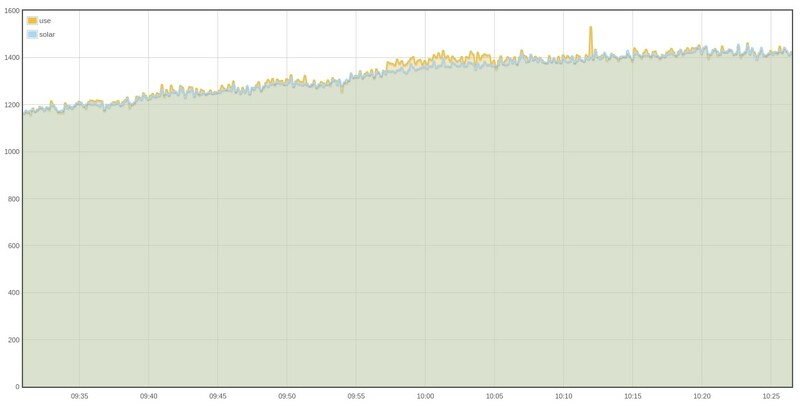 Basically when the washing machine motor is running (and not heating water) either the eddi is getting the power estimate wrong or my emontx is. I didn’t get chance to look at the meter, so I couldn’t confirm whether it was incrementing. The eddi claims to measure “AC current at grid connection point, including reactive currents”. It is configured by default to run with zero margin, although based on the emontx measurements without the motor running it exports about 25W when using the immersion. 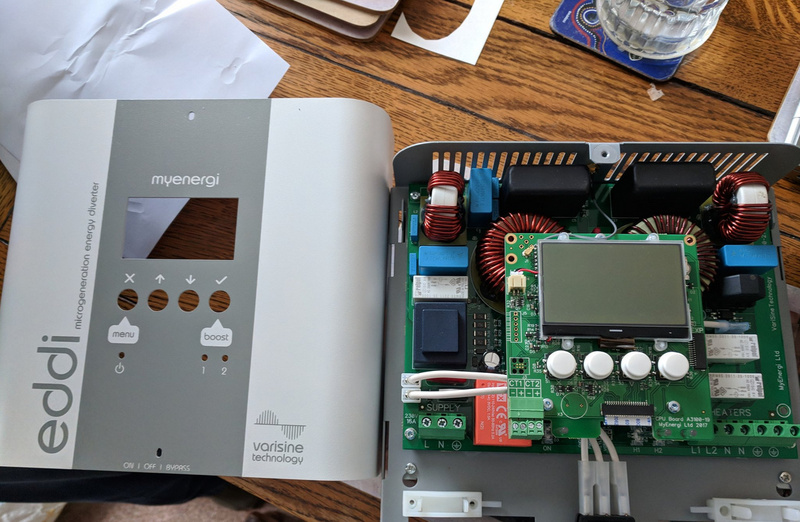 I’ve been testing a myenergi zappi EV charger with two myenergi harvis, one to measure PV generation, and another one to measure import/export at the grid connection point. The generation harvi is measuring about 40W more when PV production is low, and about 100W less when PV production is near maximum, but that is acceptable to me. The grid harvi however is often showing 100W to 200W export when I’m actually importing a small amount of energy (I have a residential storage battery which keeps the import/export close to zero) and its readings are jumping around a lot, so it’s no good for my purpose, since the incorrect readings mess with the automatic charging power adjustment in the ECO and ECO+ modes of the zappi. It works well when I hard-wire the grid CT to the zappi, and the readings are close to the ones of my battery, and the power flow direction is correct, but because of the distance between my meter box and the final location of the zappi I’d rather use a harvi with a wireless connection. I’ve opened a support ticket with myenergi and provided diagnostic data and photos, and I’m currently waiting to hear back from them why the readings of the grid harvi differ from the readings of a hard-wired grid CT, and why the harvi doesn’t get the direction of the power flow right. The Eddie wired CT seems to be very accurate in tracking export and diverting the surplus to the immersion. I would be interested to see a similar graph for the Harvi wireless CT version to see what the difference is? I’m thinking of getting an Eddi in the future, and I just realised you’re graphing hot water temp - what are you using to monitor that? My tank stat seems to have all the technology of the 1950’s to just operate a switch to close the call for heat. As I have gas-fired central heating the immersion has it’s own temp limiter (I think, haven’t taken the cover off it yet) I’m going to be relying on that to shut off the demand for heat. You seem to have a gradual cool down during the day, as the solar dies off what is increasing the hotwater temp? I’m thinking of getting an Eddi in the future, and I just realised you’re graphing hot water temp - what are you using to monitor that? I’ve opened a support ticket with myenergi and provided diagnostic data and photos, and I’m currently waiting to hear back from them why the readings of the grid harvi differ from the readings of a hard-wired grid CT, and why the harvi doesn’t get the direction of the power flow right. Have you heard back from MyEnergi? 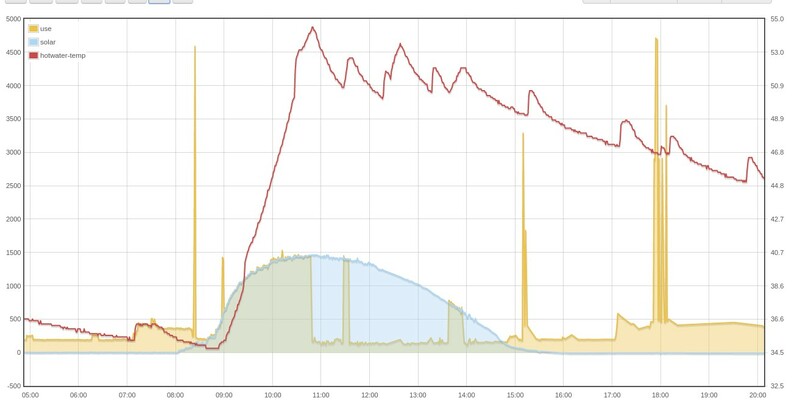 Could you post some more emoncms graphs showing how the harvi does or doesn’t match your solar PV generation? It would be interesting to compare to the wired version. Due to the power constrains of harvesting energy the harvi only transmits once every 30s @ 0.5A = 120W. Once the current reaches 240W transmissions are every 1s. This is actually rather impressive to be able to harvest enough energy at 240W using a standard CT sensor to be able to RF transmit once every second.